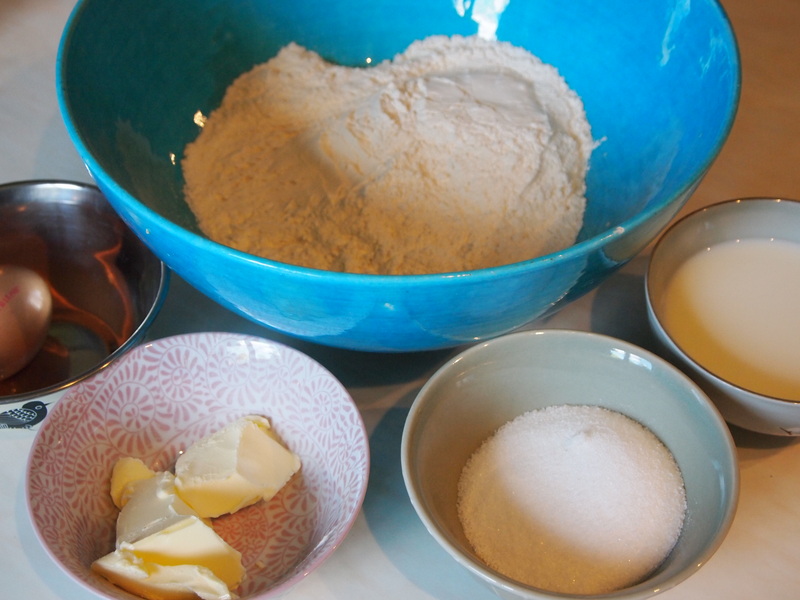 As I’ve started brushing up my bonjours and enchantees in preparation for meeting the Official Taster’s French relatives at our wedding, I was inspired to use the flavours of France for my next scone recipe. 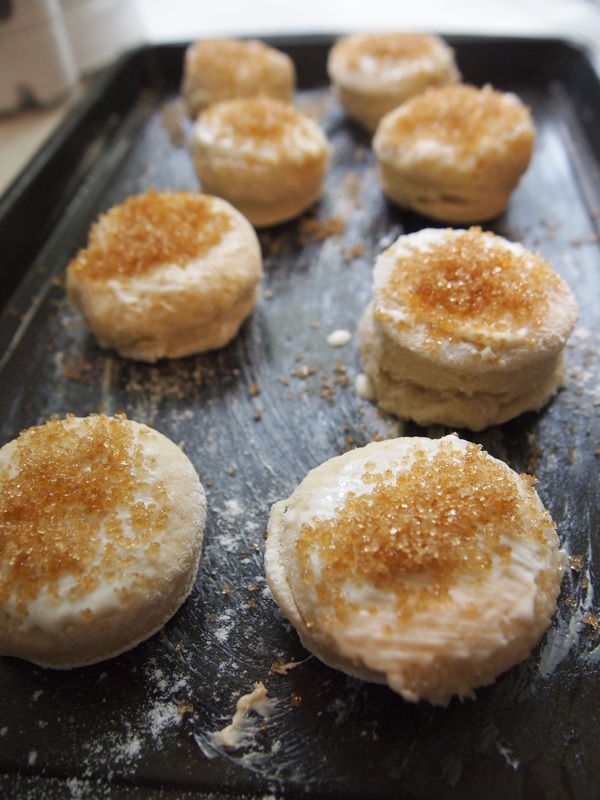 Previous dabblings into French sconery have included French Onion Soup Scones and the Fig Scones I made to eat with some delicious Pié d’Angloys, but this time I was wanted to try something a little more decadent: crème brûlée scones. Having never actually made crème brûlée (why should I let that stop me? ), I felt the need to do a little bit of research, or at least glance at a recipe. Doing so confirmed what I had thought/hoped, namely that the key ingredients in crème brulée are cream and sugar; I couldn’t go wrong. I hadn’t used cream as a base ingredient in a scone before, although I had read about using it as a substitute for butter and milk. I used this recipe from the Telegraph, which promised me lighter scones than I’d ever known, and I added about a teaspoon of vanilla essence. I was a little disappointed that the recipe didn’t include eggs, as they’re obviously important in crème brûlée, i.e. they’re the ingredient that stops it being just vanilla-flavoured sugary cream (not that there’s anything wrong with that). 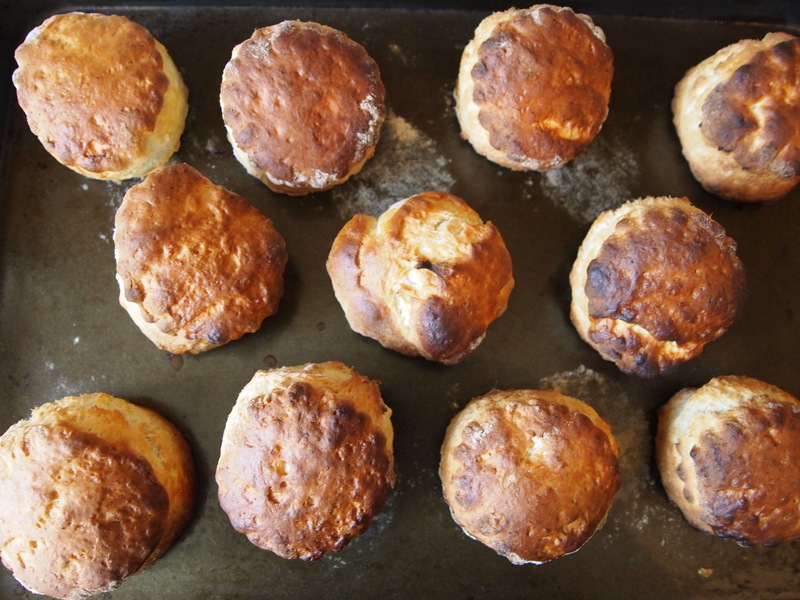 My plan was to sprinkle the tops of the scones with sugar, in the hope that it would ‘brûlée’ in the oven, but I needed to use a blowtorch once they came out to finish them off, which only led to one small scone fire. In fact, the one that looks a wee bit scorched in the picture above actually had the most authentic taste, with that smoky, very slightly bitter flavour of burnt sugar. 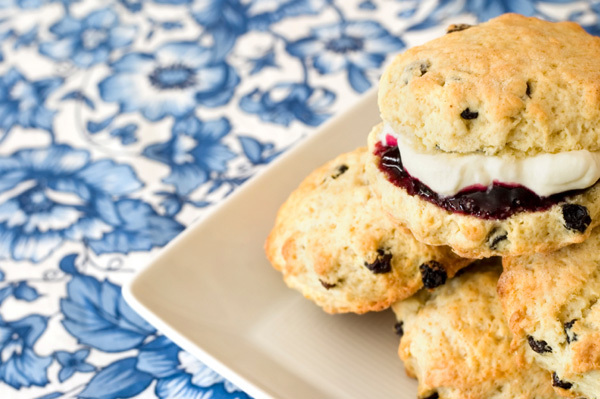 Truthfully, these scones were amazing, and made it immediately to my list of top five scones (which I don’t actually have but am considering making just so I can put these on there). 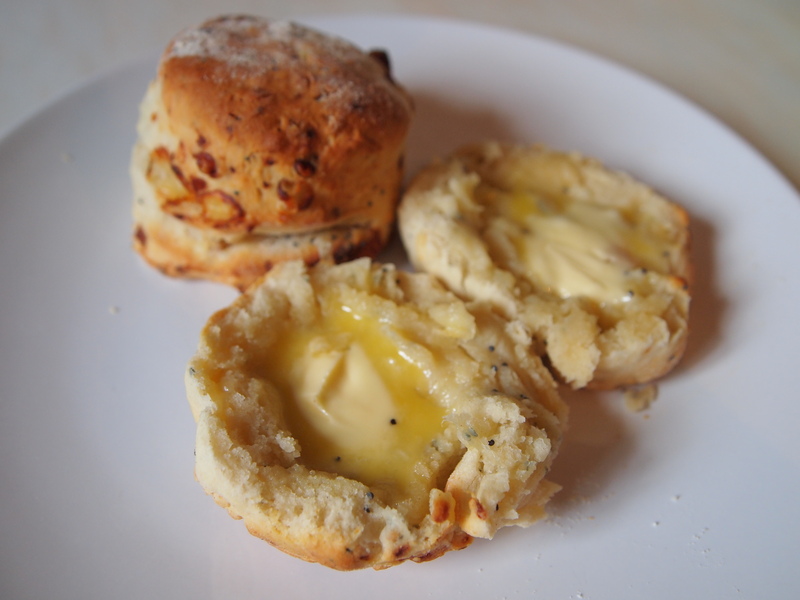 I generally prefer savoury scones to sweet ones, and cheese scones to any other kind, but these were delicious. With the vanilla and sugar, they tasted like cupcakes, but without the need for lashings of icing to make them interesting. They were light and fluffy, just like the recipe promised, with a sweet, crispy topping to contrast the crumbliness. And, out of respect to my wedding diet, I made them with a low-fat cream impersonator; imagine how good they’d be with full-fat double cream. Bake these. Bake them now. I’ve had a lot of scone action recently, but haven’t had the time to write it up (thanks, wedding). So I thought I’d combine my last three sconecapades into a bumper edition. One of my favourite comfort foods for a cold, wintry Sunday afternoon is a toasted crumpet spread with butter then topped with honey and a slice or two of cheddar. The honey and the butter mix together and soak right through to the bottom of the crumpet, the cheese goes a little bit soft but doesn’t quite melt and the whole thing is deliciously messy to eat. That’s why cheese and honey scones seemed like an obvious choice when I was craving something warm and delicious to eat. 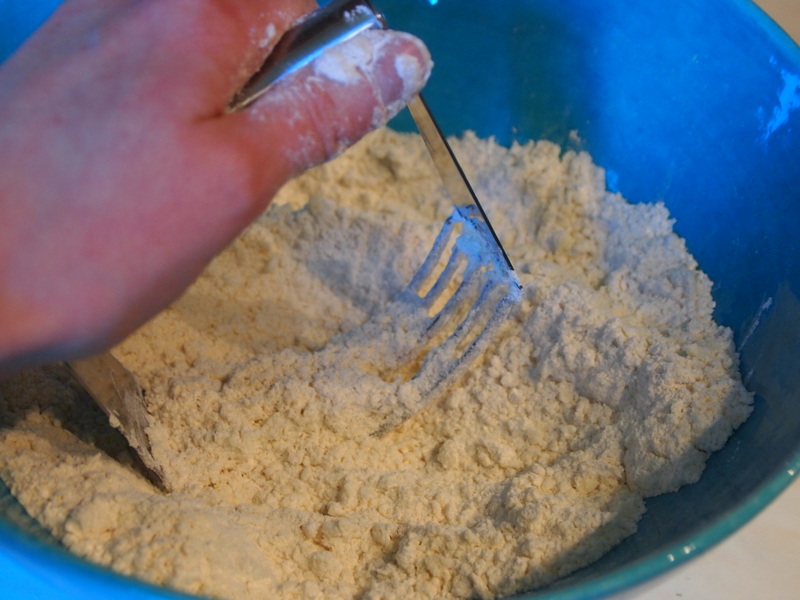 Mix together the salt and flour, then rub in the butter to make bread crumbs. 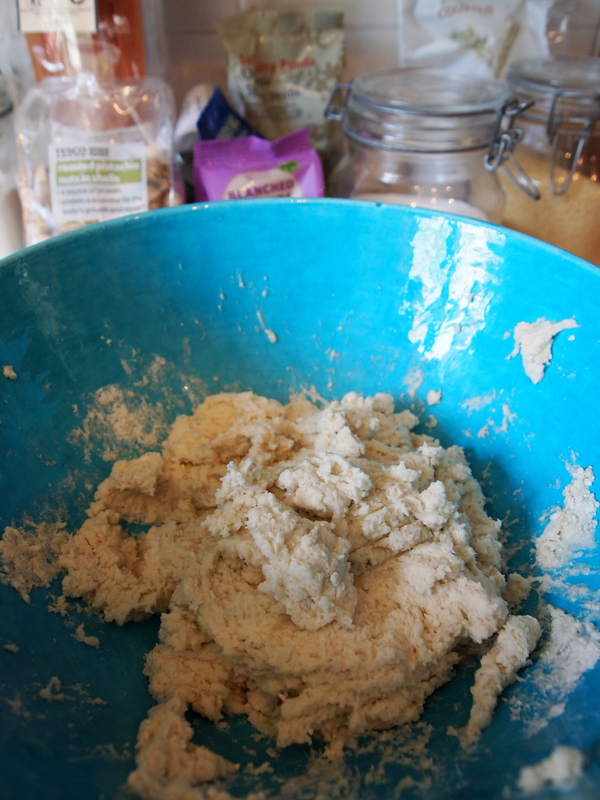 Make a well and drop the honey into the centre, then gradually stir in the milk until you have a soft, workable dough. Roll out onto a floured surface and cut out rounds about 6cm across and ¾ inch thick. Place on a greased baking tray and bake at 180°c for about 15 minutes or until golden brown. You can do something perfectly a hundred times and think you’re an expert, but every now and then things still go horribly wrong. I pulled these scones out of the oven far too soon, proudly presented one to the Official Taster then watched, mortified, as he cut it open only to find out it was still gooey inside. And not a delicious, cheese-and-honey kind of gooey you’ll find later in this post, but the uncooked-dough kind. Back into the oven they went. When they came out the second time they were significantly improved. The flavours were subtle, particularly the honey, but you could taste a hint of sweetness against the cheese. The verdict: Worth an experiment but I’ll stick to adding things like mustard or chilli to my cheese scones, and save the honey for my crumpets. P.S. The dots in the picture are poppyseeds, which I’d forgotten I’d added. I’m not sure why I did, now. Last weekend was my Granny’s 100th birthday, meaning my whole family, including cousins I hadn’t seen for nearly 20 years, converged on her little flat in Leicester. In preparation for this, I made 40 scones (well, actually 43) to go alongside a huge spread of party food. I used the same BBC recipe as when I made a similar quantity of scones for my friend’s hen do. Unfortunately, I didn’t think about taking a photo of them until they were packed up and ready for the drive, at which point I realised that nothing makes scones look less appetising then cramming 40 of them into a Tupperware box. 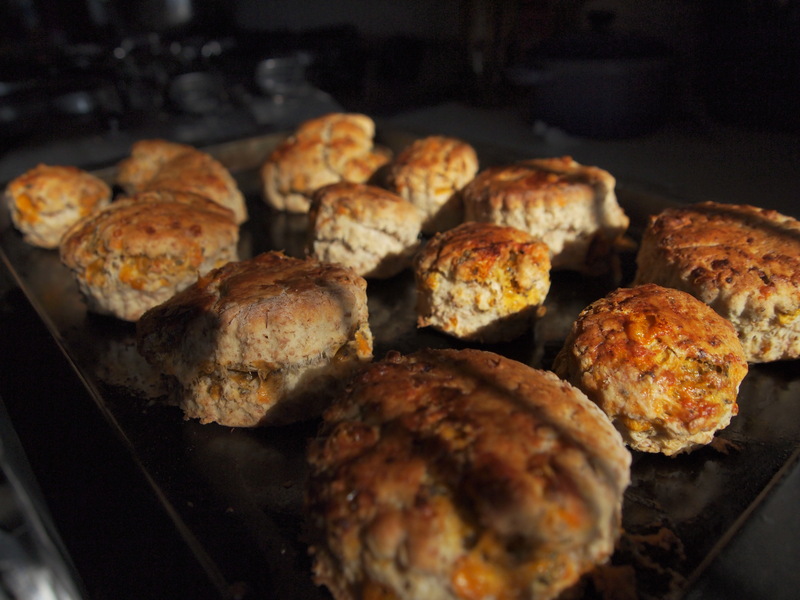 Here are the scones that came home with me at the end of the party – should I be offended? Anyway, happy birthday, Granny. I’m sorry the card I got you wasn’t as fancy as the one the Queen sent, but she didn’t make you scones, did she? DID SHE?? 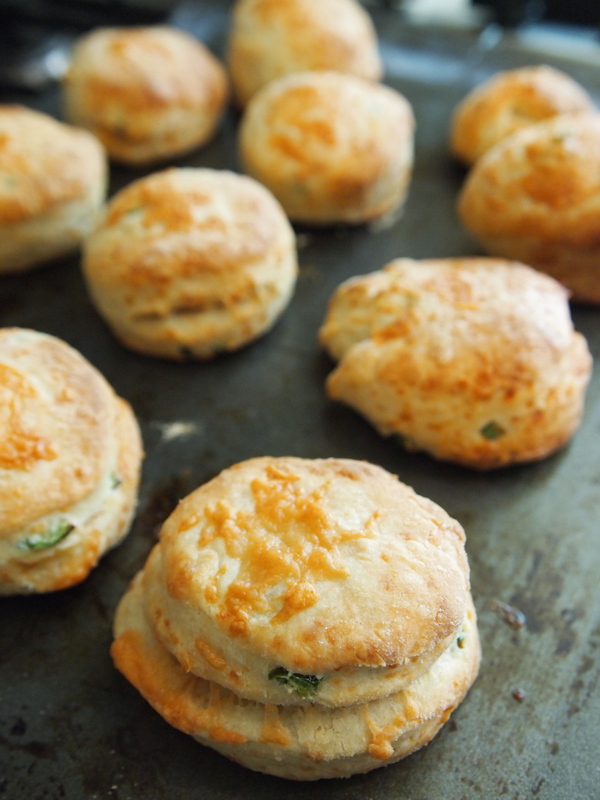 If you’ve been reading this scone blog since the beginning, you may remember that cheese and chilli scones were the first I ever posted about. They are a firm favourite of the Official Taster and made an accidental reappearance last year (in fact on my Granny’s 99th birthday) as Cheesy Chilli Bombs. When I was making the aforementioned 43 plain scones for the party, a hungry-looking OT walked into the kitchen and asked if there was any chance just one of the scones could be converted into a cheese and chilli scone, using one of the Serrano chillis growing on our window sill. I explained to him that the dough was already sweet, so wouldn’t work with cheese and chilli, but I couldn’t bear the forlorn look on his face, so promised to make him a batch all to himself after the party. He also requested that they be ‘all melty’ on the inside, something I previously attempted when I made French onion soup Scones. I used the same recipe as the first time I made cheese and chilli scones, but when I rolled out the dough, I made it half as thick as normal, sprinkled grated cheddar on one half, then folded it over like an omelette. Then I rolled it out a bit more to squash the top and the bottom together, before cutting out the rounds and baking them as normal. They still pulled apart a little in the oven, but the cheese inside still stayed all melty instead of getting crispy like I was worried about. The proof of the scone is in the eating, and these didn’t barely lasted the day. Cupscones. Sconecakes? Either way, there’s rum in them. I had no intention of writing a post this week. 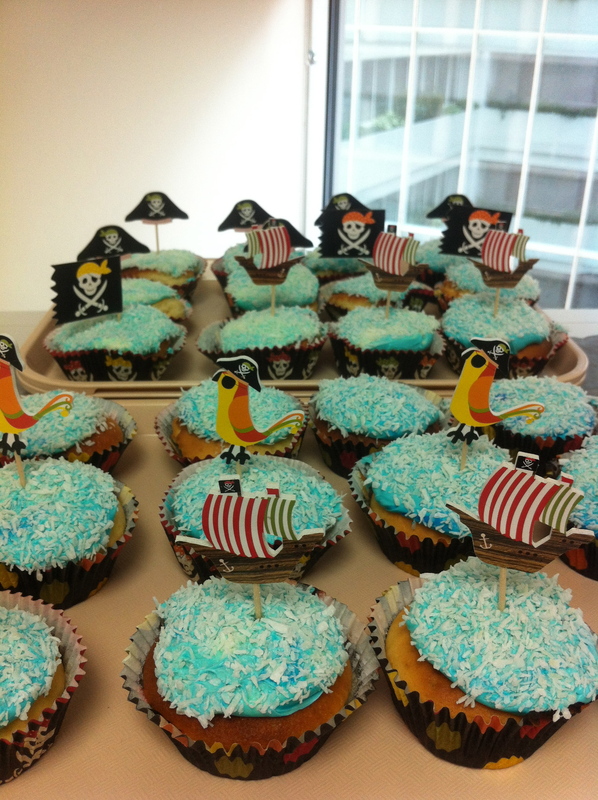 The only baking I planned to do was a batch of cupcakes for a colleague’s last day at work. But it seems that I’ve now become so used to baking scones that even when I try to make something else, the outcome is scone-like. …a batch of… sconecakes. Or cupscones. 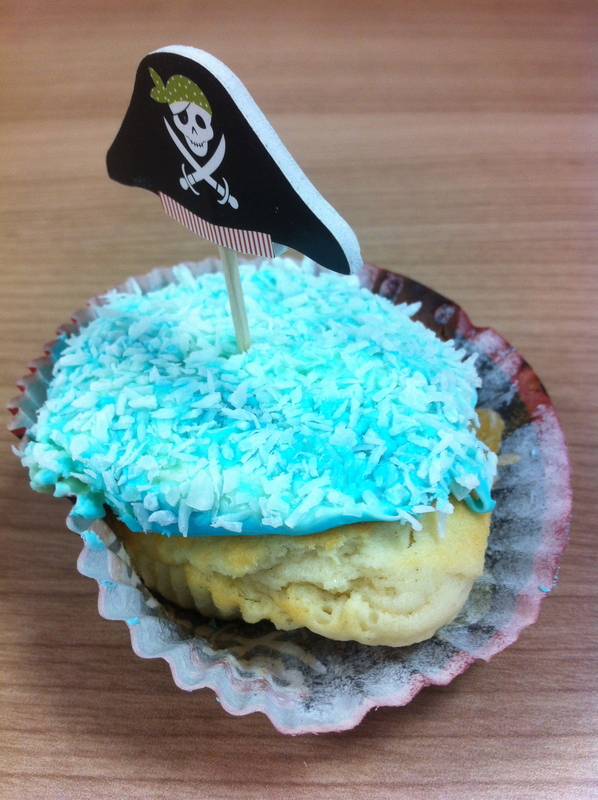 I would have a better picture if I hadn’t hurried to cover my shame with bright blue icing and dessicated coconut. 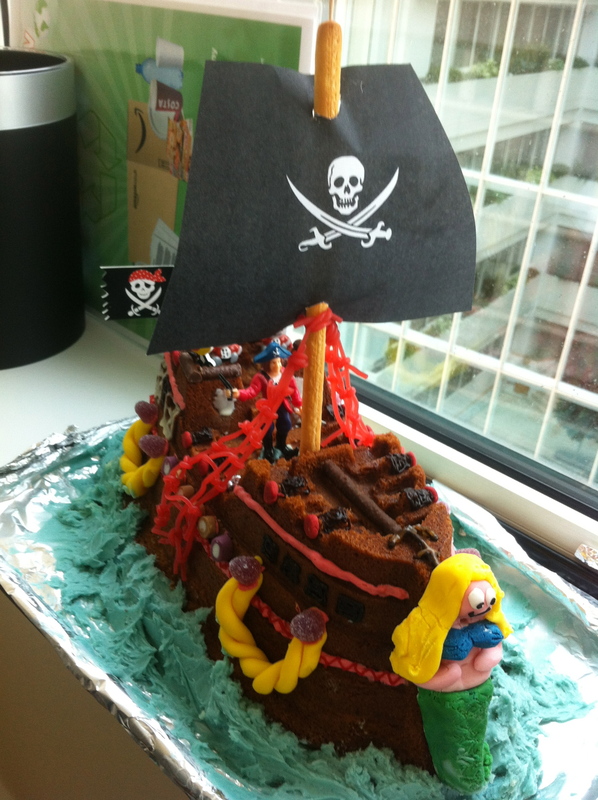 Still, despite the slightly odd shape, they tasted good and worked well as the ocean which the pirate ship cake (the main event) sailed in. from → Not scones!, Scones! One sunny Monday morning, a little girl skipped happily into school, carefully clutching a box of homemade scones she’d brought in to share with her friends. Break time came and the little girl shared out the scones among her friends, spread with butter and a homemade glittery jam she’d been saving for a special occasion just like this. Her friends were delighted with the scones and they were all enjoying their impromptu tea party, until one friend asked the little girl how she had made them. The girl started to describe the packet of scone mix her mummy had bought for her, and how they had made them together wearing their matching aprons, and how the secret ingredient was love. They picked up the remaining scones and crumbled them in the little girl’s face, which she didn’t mind all that much because the scones were still of a very high quality, despite being the slightest bit burnt. Then the former friends pushed the little girl in a muddy puddle and emptied the contents of her school bag on top of her before walking back to the classroom, laughing to each other. ‘Homemade scones, indeed!’ they howled. Some time ago, my mum gave me a bottle of rosewater and suggested I could use it in a scone recipe, so she really is the inspiration for this week’s post, although I also took ideas from this recipe from the BBC (RIP Something for the Weekend) and this recipe from about.com. That bottle of rosewater has been sitting in my cupboard for quite a few months, largely forgotten but always ready and waiting to spring into action when I needed it most. The addition of cardamom sounded guaranteed to impress, and had the added benefit of making me feel like my sizable collection of rarely used spices was justified. They were, in fact, delicious. 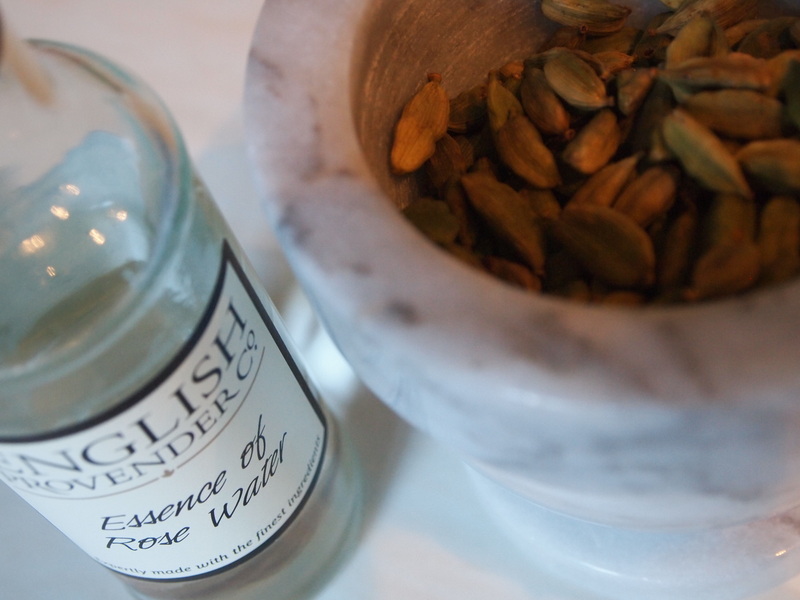 Rosewater is a very subtle flavour, but the cardamom really helped to bring it out, as well as emphasising the sweetness. Preheat the oven to 180°c. Sift together the flour, sugar and baking powder. Crush the cardamom pods to release the seeds. Remove the husks and grind the seeds in a pestle and mortar. Add to the dry ingredients. Add the butter and rub into the dry ingredients to get a breadcrumb-like texture. Make a well and add the egg, rosewater and some of the milk. Stir together until you get a firm dough, adding more milk as necessary. 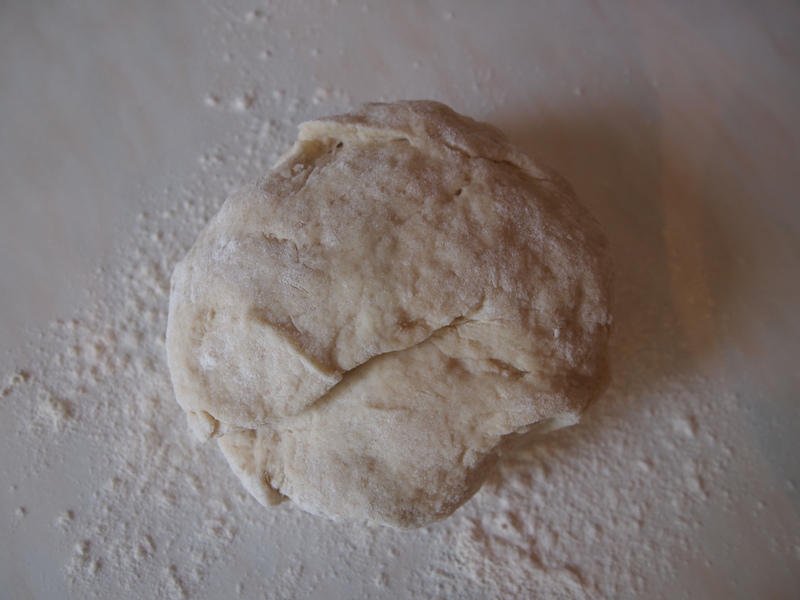 Roll the dough out on to a floured surface. Use a 6cm cutter to cut out rounds and place on a greased baking tray. Brush with milk and cook for about 10 minutes or until golden and delicious (if you end up with a golden delicious, however, something’s gone wrong). Remove from the oven and enjoy hot with butter and jam, or take to work and wipe the smirks off your colleagues’ faces. Can’t Bake It? Fake It. This week I thought I would test for the first time a packet scone mix, namely Tesco’s imaginatively named Scone Mix. All you have to do is add milk to the ready-prepared mix. 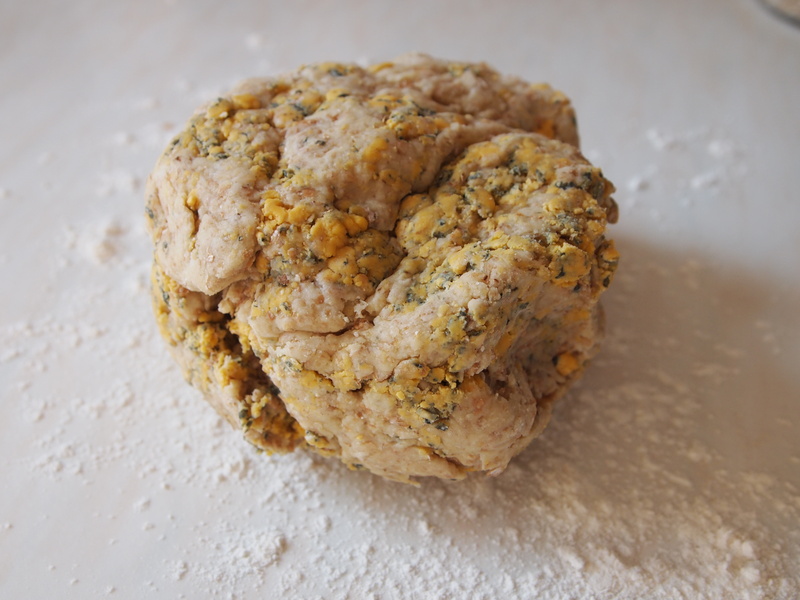 It was a really nice dough to work with – very light and fluffy. I had to add a little extra flour but apart from that it was pretty much spot on. I could try and blame the fact that I burnt the scones on the recommended baking time of 10 minutes, but in their defence, all ovens are different and I should have checked after about 7 minutes (and would have if I hadn’t been too engrossed makingdukka from Hugh Fearnley-Whittingstall’s wonderful River Cottage: Veg Every Day recipe book. Despite being a little bit too golden brown, the scones were still pretty tasty, and were very much enjoyed by my colleagues, along with the glittery homemade jam the Official Taster had been given. 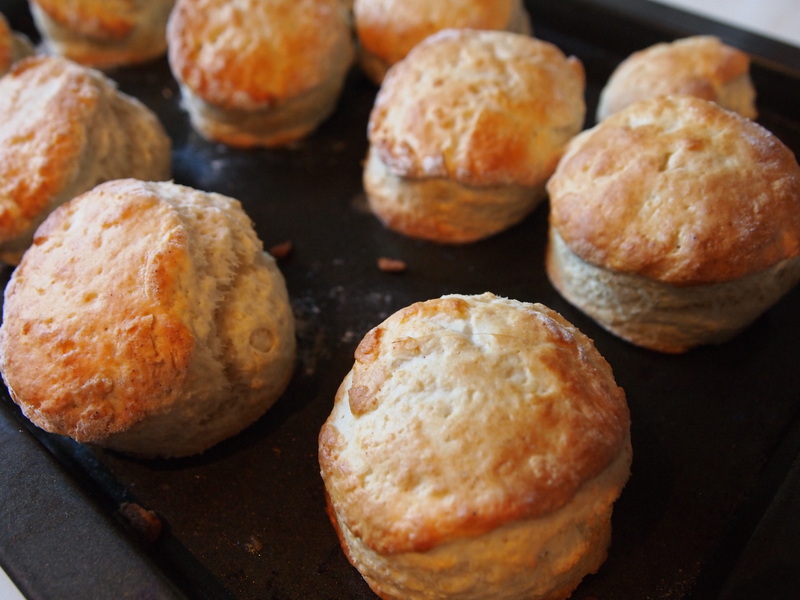 I don’t think it was significantly quicker to use the scone mix than making them from scratch – it shaved off perhaps 10 minutes of measuring time. Where the mix really can’t be beaten, though (pardon the pun), is in price. The 320g of scone mix, which was supposed to make 6 scones but actually made far more, was 64p (plus the cost of milk) as opposed to buying butter, flour, milk, sugar and possibly eggs separately. In summary, if you don’t crave the sense of pride you get from baking from scratch, this mix is a perfectly reasonable option, and I look forward to testing out more scone mixes in the future. Although I usually like to theme my sconery around some sort of event (weddings, holidays, festivals, mood swings…), there was no inspiration for today’s baking other than finding myself with an overabundance of blue cheese (never a bad position to be in). The particular cheese I used to make these scones was Butlers Blacksticks Blue, which was much easier to find a picture of after I stopped Googling ‘Candlesticks Blue’. 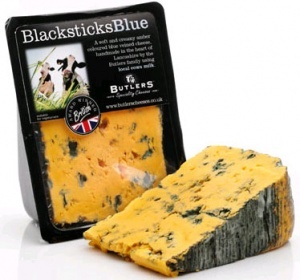 It’s described as creamy with a smooth texture and tangy flavour. Preheat the oven to 200°c. 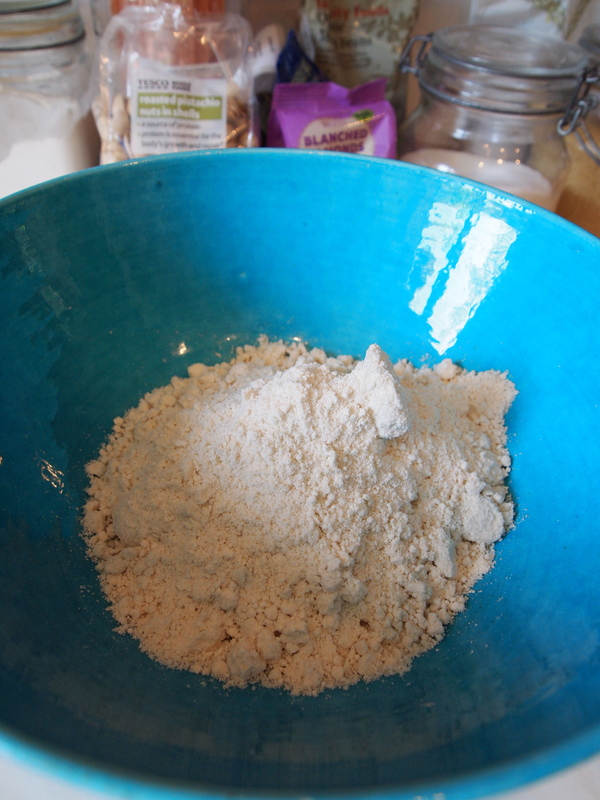 Stir together the flour and baking powder in a mixing bowl and mix in the butter to make breadcrumbs. Beat the egg with the milk and add a small amount at a time, stirring into the mixture to make a stiff dough. Then knead in the grated cheese until it is evenly distributed throughout the dough. 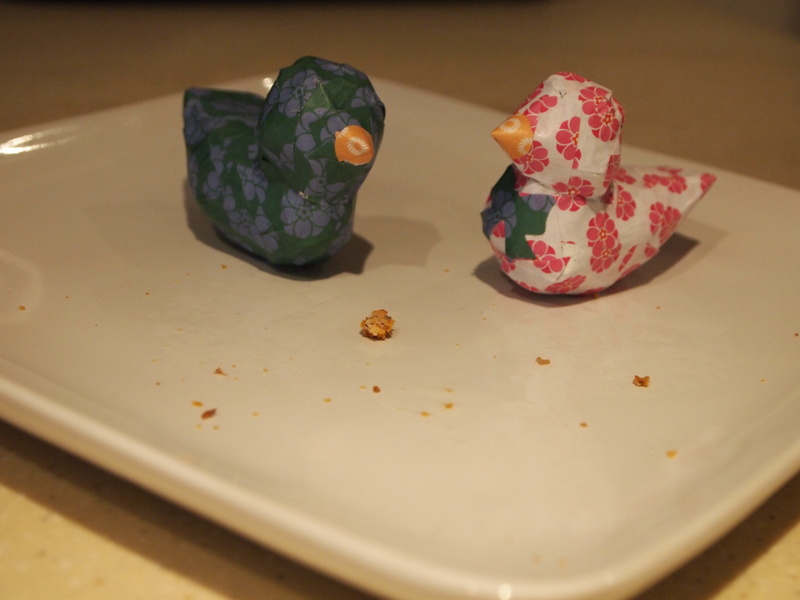 Roll out onto a floured surface, cut out rounds and place on a greased baking tray. 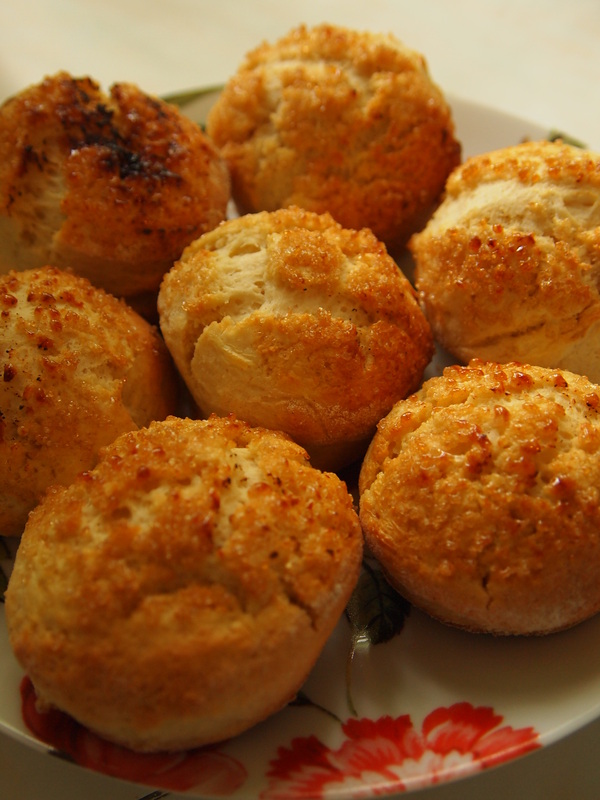 Brush the tops of the scones with milk and bake for 10 minutes or until golden brown and bubbling with cheese. This was the first time I’d used egg in a scone recipe and, to be honest, I don’t think it made a noticeable difference to the finished product. I think the tanginess of the cheese added an interesting flavour, but there was only a slight hint of ‘blue’, something the Official Taster agreed with. I have a new fan to thank for today’s scones. I woke up to an email saying that My Life in Scones had a new subscriber, which must have put the idea of baking scones into my head after several month’s break. This morning I woke up starving with no breakfast food in the house (how did we let ourselves get into this state??) 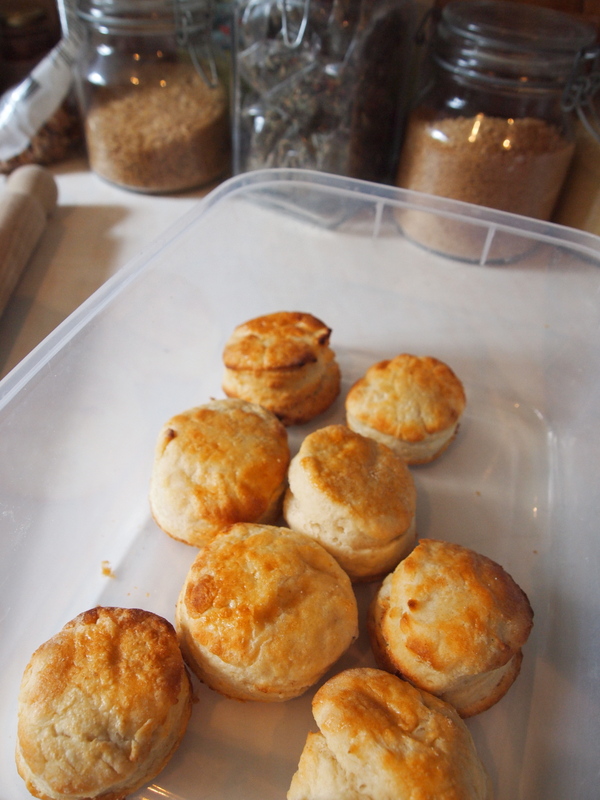 , so I had the brainwave of baking some cheese scones. Unfortunately, I’m easily distracted, and as I was pulling the butter and cheese out of the fridge, I came across some leftover pizza sauce from when we had entertained the Official Parents earlier in the week. 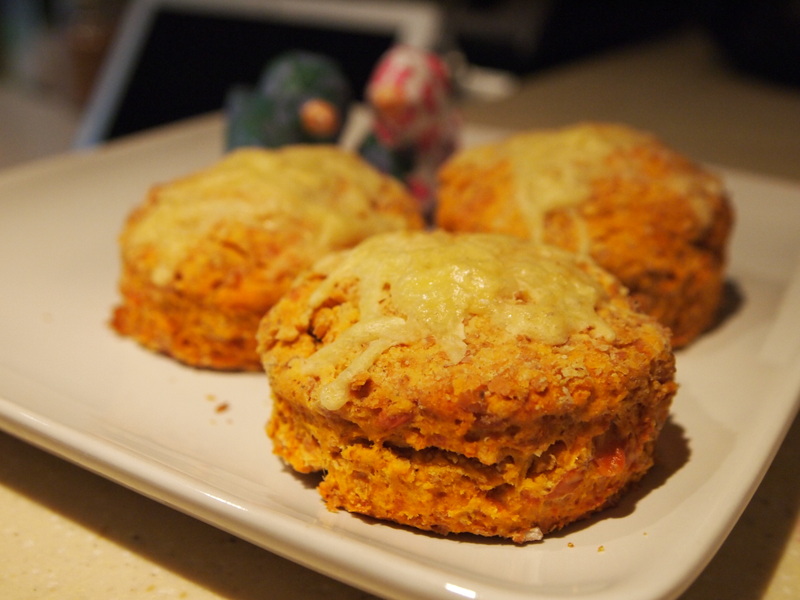 ‘Pizza scones?’, says I, ‘that’s new!’, and I set about following this recipe for cheese scones, replacing the mustard and milk with pizza sauce. It would have been nice if we’d had some mozzarella left over as well, but I’m hoping that as this was a spur-of-the-moment creation,any Italians reading this will forgive me the use of cheddar. Into the oven they went, and they came out looking pretty tasty and smelling very much like pizza. This is all well and good, but pizza is not a breakfast food (there are people who may tell you they’ve seen me leaning out of bed in the morning to pull a cold slice of last night’s pizza out of the box, but that is a lie and I will sue). Still, they tasted pretty good – the pizza taste was subtler than it smelt – so I would definitely deem this experiment a success. For anyone who would like to try this themselves, I made the pizza sauce by bunging random quantities of tinned chopped tomatoes, tomato puree, onion, garlic, basil and a pinch of salt into a blender – is that helpful? And here are the ducks on their own, for no reason other than they're cute. They ate all the scones! HAAAA!